Sweet potato pie is one of those Thanksgiving traditions I was completely oblivious to until I moved to the South. The extent of my knowledge of sweet potatoes for Thanksgiving started and ended with sweet potato casserole. You know, that super sweet "casserole" that is topped with loads of marshmallows and somehow always gets served as a side dish and not as a dessert. Yeah, I never quite understood sweet potato casserole. I totally understand sweet potato pie! If you are going to dress sweet potatoes up with sugar and butter, call it what it is! Dessert! Put it in a pie crust and call it a pie. It's delicious. And, if you just can't seem to get on board with sweet potatoes without the marshmallows, I've got you covered! Just top that baby off with a healthy meringue topping that is just as good (dare I say, better?) than a marshmallow topping. Starting with the pie crust, I rolled out my favorite pie dough and transferred it to my pie dish. Then I covered the pie dough with tin foil and filled it with pie weights to partially bake (par-bake). Note: I was a little hasty in par-baking the crust and didn't freeze it beforehand so it ended up shrinking. 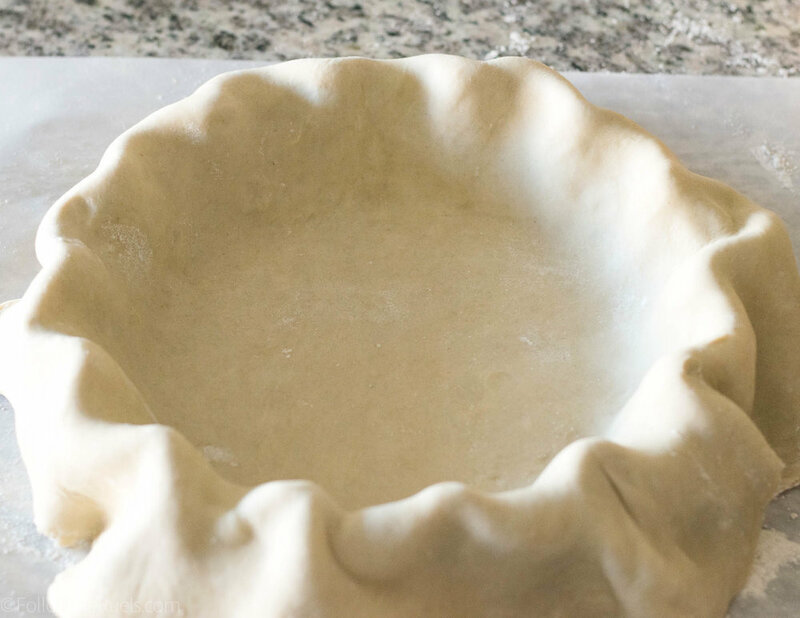 To prevent shrinkage (hold the jokes), freeze the pie dough in the pie dish before placing it in the oven. While the pie crust baked, I microwaved the sweet potatoes until they were completely soft and I could easily spoon the potato away from the skin. 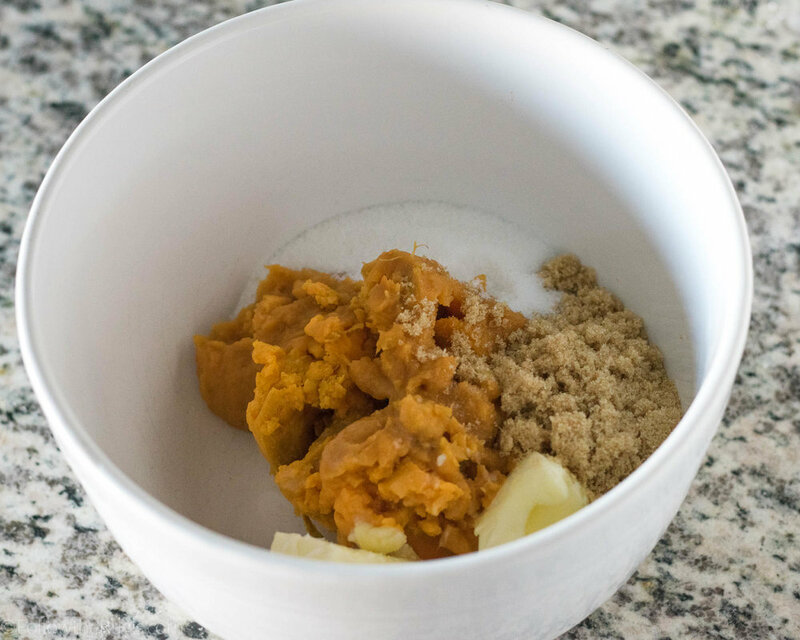 I added the sweet potatoes, along with sugar and butter in a large bowl and gave it a good whisk until it was smooth. Then I added the egg, egg yolks, cream, vanilla, and spices and gave it another good mix until it was completely smooth. Then all of that got poured into the par-baked pie crust. Custard pies can be a little tricky to know when they are completely done baking. The pie should still have a little wiggle in the middle, but the top should be totally dry and the pie closest to the crust should be set. Once the pie reached that point, I removed it from the oven and let it cool to room temperature. It will continue to set as it sits out and cools. I used the waiting time to clean up and make my meringue. I used the French method, which I describe in detail in this buttercream post. Once the meringue formed semi-stiff peaks, I just dumped it right onto the pie. You can spread your meringue out however you like. I wanted it to look a little spiky so first spread the meringue our across the pie, then used the spatula to form little peaks across the top by pulling the spatula up in short quick motions. Finally, I placed the pie back in the oven under the broiler to caramelize the meringue. You could also use a kitchen torch if you wanted to have more control over your caramelization. But, you know, I like to live life on the edge sometimes. I just stick my pie under the broiler and wait to see what happens. I loved cutting into this and seeing that meringue piled high on top. 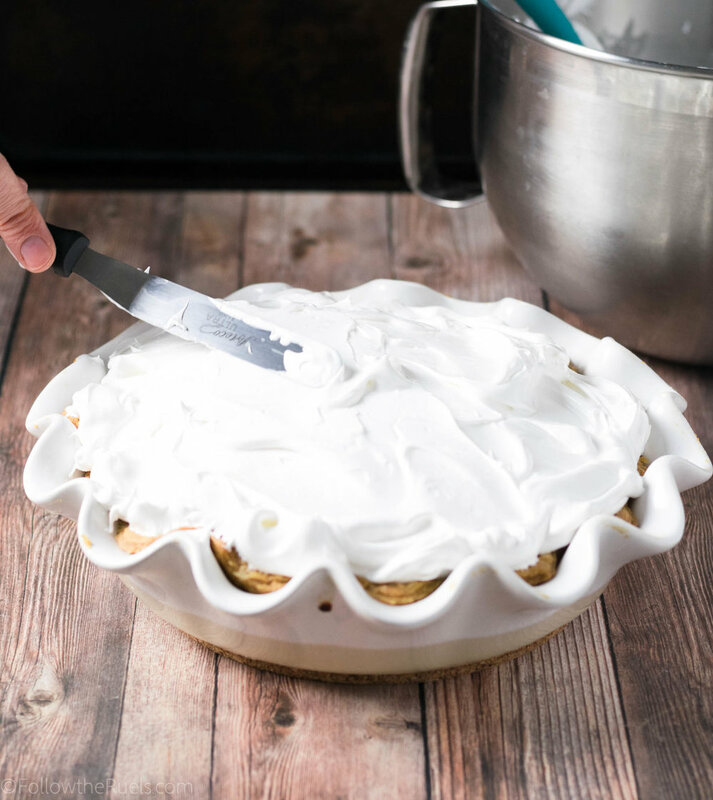 The meringue may be my favorite part of this pie! 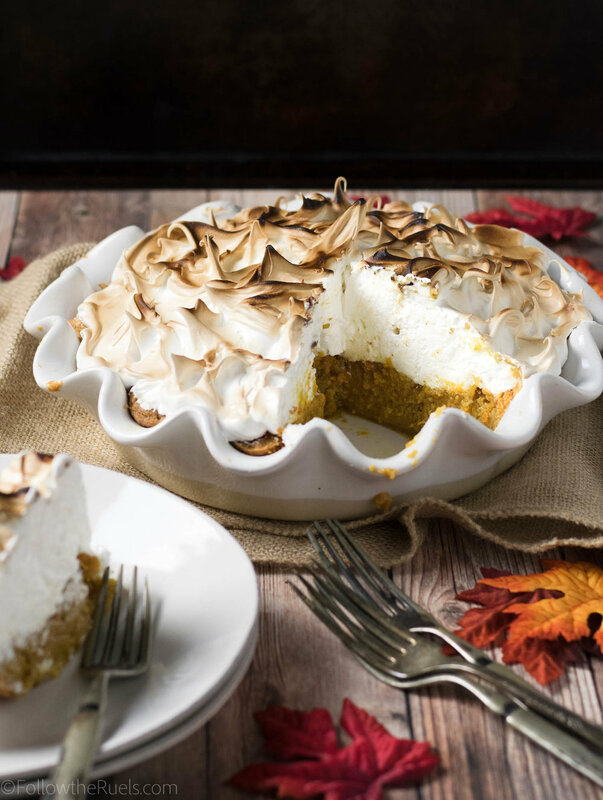 Meringue is just so perfect on top of a dense custard pie like sweet potato pie. That super soft meringue just balances everything else out. It's like a lighter version of a whipped cream topping. 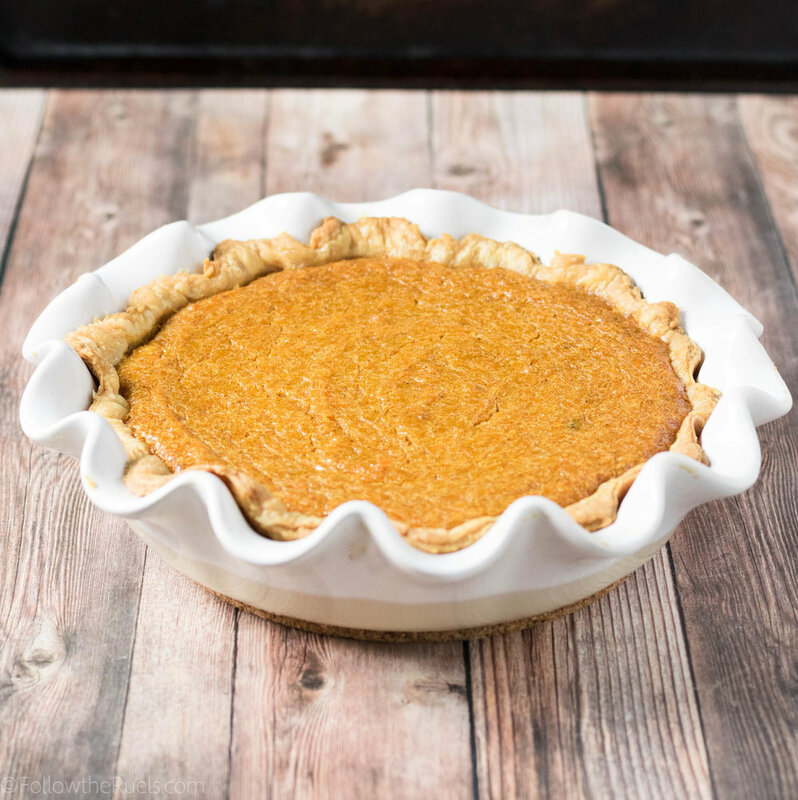 It provides a little extra sweetness, but not nearly as much as a marshmallow topping would, and helps cut through the richness of the pie itself. Have I convinced you to make this for Thanksgiving? Well, I certainly convinced myself! Roll out pie dough to 1/4 inch thick. Roll dough around the rolling pin and transfer it to the pie dish. Press the pie dough into the dish so that it fits snuggly in the corners and around the edge. Trim any excess from the edge. Place the dough in the freezer for 15 minutes. Preheat oven to 350 degrees. Press a piece of tin foil into the pie crust and fill the cavity with pie weights or dried beans or rice. Bake for 20 minutes until slightly browned. 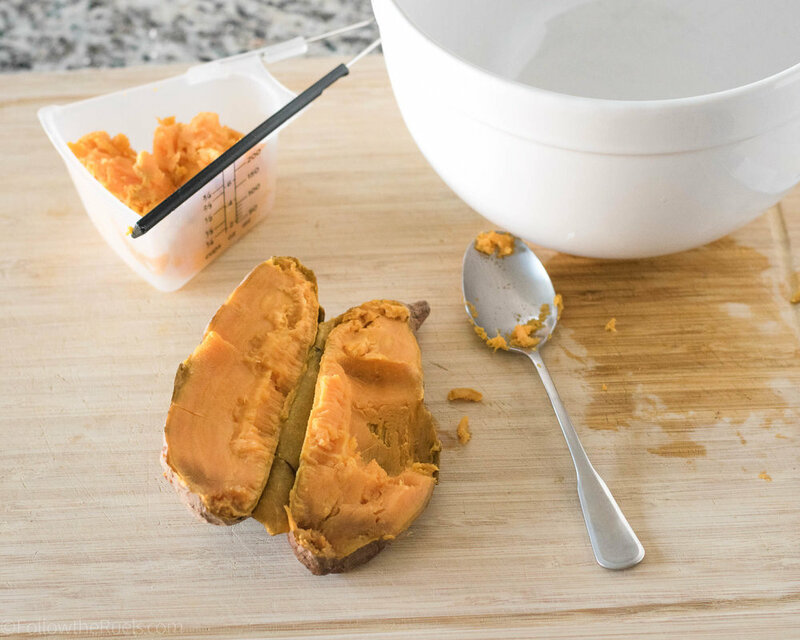 Meanwhile, scoop the sweet potato from the skins and place into a bowl. Add in butter and sugar and then mix until light and smooth. 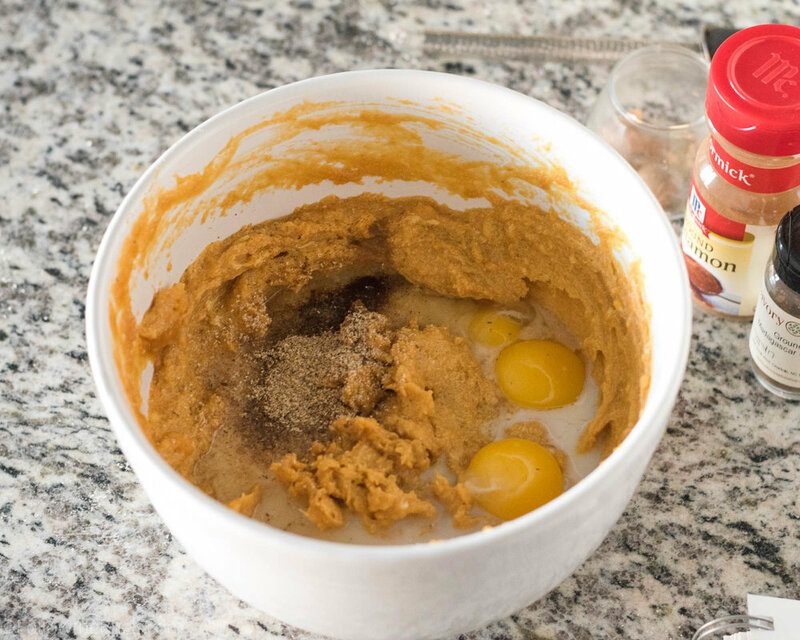 Whisk in egg, egg yolks, cream, maple syrup, and spices. If mixture appears lumpy or curdled it's the pieces of butter being rechilled by the cold eggs or cream. Avoid this by using room temperature eggs and cream. If not, the pieces will melt once they bake. Remove the pie weights and tin foil from the pie crust. Pour the filling into the pan. Place back in the oven and bake for 50 minutes, or until the pie close to the crust looks set, but the center is still a little wiggly. Let the pie cool to room temperature, about 30 minutes. Then start making the meringue. Using the French meringue method, fill a small sauce pan with water and place over medium high heat. Bring to a simmer. Place a bowl of a stand mixer with the egg whites and sugar over the sauce pan so that it is not touching the water. Continually whisk the eggs so that they become light and fluffy. Once the sugar has melted (Check by rubbing a bit of the egg whites between your fingers. If it is smooth, the sugar has melted), transfer the bowl to your stand mixer. Mix on high speed for 10-15 minutes, until the eggs are fluffy and form semi-stiff peaks (the will stand straight up, but curl over at the top). Spoon the meringue on top of the pie. Use a spatula to spread it over the surface. To create texture and peaks, lift the spatula up in short, quick motions all over the top of the meringue. Place the pie back in the oven under a low broiler. Broil for 3 to 4 minutes, until meringue is golden brown.